Paso Robles provides us with exceptional Merlot fruit that is typically more intense and structured than its cousin, Cabernet Sauvignon. 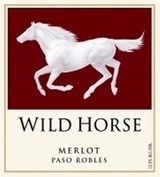 Wild Horse Merlot is a wine that provides rich ripe fruit flavors balanced by bright acidity. The soft, rich tannins, acidity and long finish make this wine an ageworthy contender.